One of the little things that computer users can do to improve the overall security of their computer system is to check the open connections regularly. Specifically, the programs that try to communicate with servers on the Internet or other networks. Programs like CurrPorts or MyPorts list all programs and services on the computer that listen for incoming connections or have already created connections with other servers and computer systems. Moo0 ConnectionWatcher is another program that can display a detailed list of those programs. The application is available as a portable program and installer, and will display all open connections on startup. The interface looks similar to the file monitoring application by the same developer which I reviewed yesterday. Each connection is listed in its own line, with detailed information about the protocol, process id, process name, local and remote port and data that has been received. A right-click on any entry opens a context menu with options to close or kill the process, locate the program on the computer's hard drive, disconnect the connection or open the program's properties. The status bar displays statistics about the number of open connections, the protocol, and the data that is currently received and sent. Besides the option to display the current connections, it is possible to view a log with past connections as well. All connections are sorted by date and time, with options to save the log to the local computer system for future reference. The connections in the current and log view mode can be sorted by all columns, for instance by application name, port number or bytes received. The View menu at the top can again be used to change the update frequency of the data and the number of log entries that the program stores at the same time. 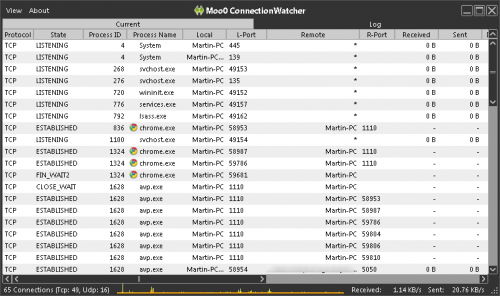 Moo0 ConnectionWatcher is a handy program to monitor Internet and network connections. It is not as lightweight as CurrPorts though, and could use advanced features like filtering, alerts and notifications, references and web searches. The program is compatible with recent 32-bit and 64-bit Windows operating systems. It was tested on Windows 7 Professional 64-bit. I use TCPview from Sysinternals. It is almost the same, in a 194kB file, but without logging. OK, I’m going to block the IP Martin.